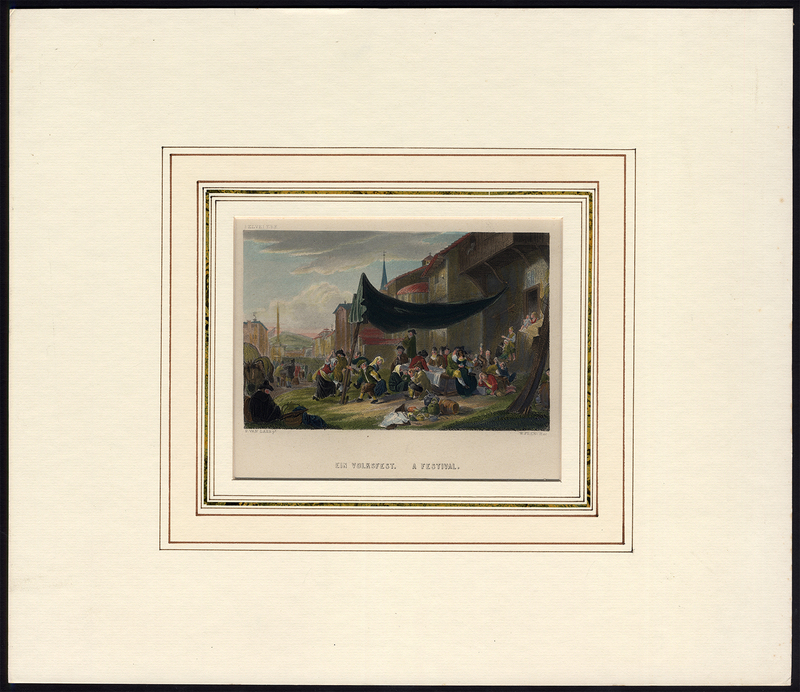 Subject: Antique print, titled: 'Ein Volksfest'. It shows: ('A Festival'), a group of villagers gathered in a clearing in a village, surrounded by buildings. An awning has been created for shade, and food and drink is present. Medium: Handcoloured etching/engraving on a vellin type paper. Size (in cm): The overall size is ca. 40.5 x 35 cm. The image size is ca. 16.5 x 13.5 cm. Size (in inch): The overall size is ca. 15.9 x 13.8 inch. The image size is ca. 6.5 x 5.3 inch. Description: Exact source unknown, to be determined. Published ca. 1840 (estimate). Artists and Engravers: Engraved by W. French after P. van Laer.